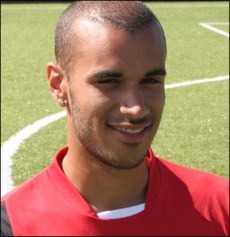 Following last nights defeat at Halifax Mark Yates, the Kidderminster Harriers manager, has acted quickly to shore up a suspect defence and also to add a more creative defender to the squad by bringing in the Paul Bignot (below), the brother of the Harriers legend Marcus Bignot (right), on a one month loan from Crewe. With the ongoing loss of the similarly creative Jeff Kenna it was obvious that the right back berth wasn't being covered adequately by Jake Sedgemore although there is also a case for replacing the left back spot due to the poor performances in recent weeks from Jonny Harkness. Paul, who is some ten years younger than his illustrious brother, has been on the books at Gresty Road since schoolboy days and made his debut for the club in a Carling Cup win against Sunderland in September 2004 after being part of the Under-18 side which reached the Semi-Finals of the FA Youth Cup in 2003/04. So far he has made eleven first team appearances for Crewe but has yet to play this season after suffering a thigh strain while playing in a reserve game. His chances of first team football are now slim while the good form of Darren Moss and Jon Ostemoboor continues so he has come to Aggborough to regain his fitness too. Mark Yates said after the news was released: "Paul is a good defender and very good at defending in one-on-one situations. He'll give us that bit of solidity, he can play naturally at right back or centre back which is good for us with Jeff Kenna still out for a couple of weeks more. I'm grateful to Dario Grady and Crewe for letting us bring him in for a month." His big brother, Marcus, signed for the Harriers from Telford Utd in August 1996 and went on to make fifty six appearances for us before joining Crewe Alexandra a year later for a figure believed to be in the region of £100,000. He spent three seasons at Gresty Road before joining Bristol Rovers, then in the old second division. Paul should be making his debut for us in the game against Grays at Aggborough this Saturday.